A lot of things pass for punk these days, from tattooed Warped Tour screamers, to cute, young, friendly pop stars with guitars and crazy hair, to a lot of the bands that operate under the Indie banner. 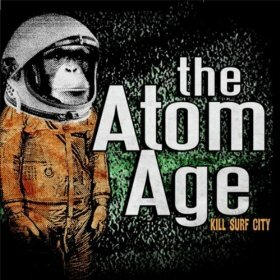 That’s why it’s nice to be able to point to a band and say, without a shadow of a doubt, “This is a punk band.” From the moment The Atom Age’s debut Kill Surf City begins, it’s clear what the best word to describe them is. The album’s first track, “Turn It Around,” starts with lightning guitar riffs that are quickly followed by thunderous drums. There is little, if any, time to catch your breath in between each of the thirteen songs, which is the true definition of pop-punk. The songs are catchy and you can sing and dance to them, but they have grit and attitude and are often played really fast and hard, just as The Ramones were. With the saxophone to set them apart, on top of great songwriting, The Atom Age are one of the best and certainly one of the most interesting new punk bands out there today.